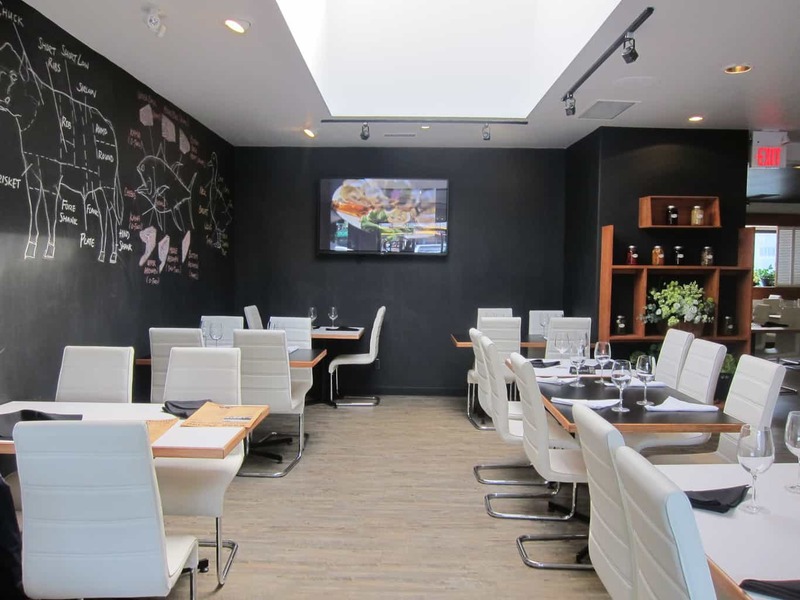 With a skylight in the dining area, the restaurant was filled with bright natural light, creating a clean, comfortable atmosphere. Additional dining space was spotted in another section for larger parties. I liked the white decor, giving it a “zen” feel. 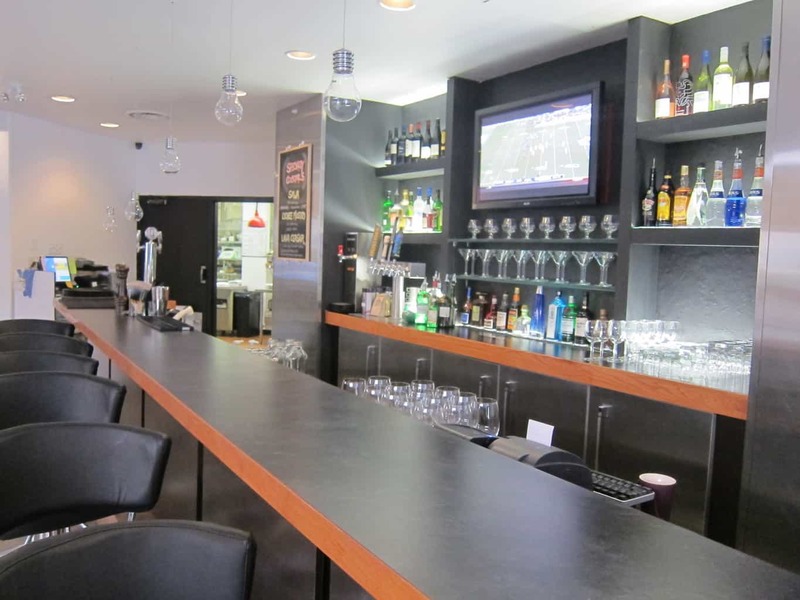 There’s also a bar counter for people who would like to watch sports and enjoy a few sips of wine. 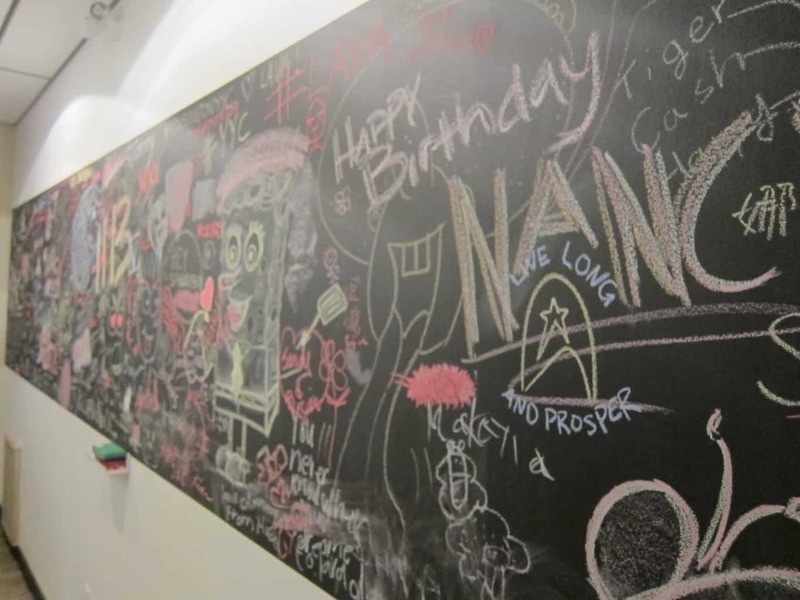 At several corners, cute chalkboard drawings were created to bring casual elements to the space. 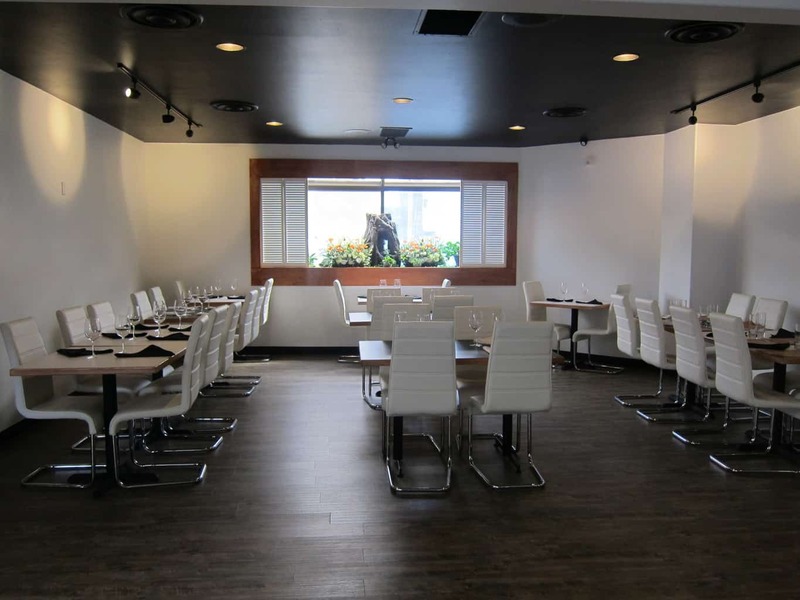 After taking a tour around the restaurant, we were surprised how spacious the interior was! It really set you right in the mood to relax and enjoy a wonderful meal. From its brunch mean, I selected the lava eggs benedict with duck confit ($16). Wow, nice presentation! The dish came with a choice of side, either soup, salad, fries or chips. I had their daily soup, which included asparagus as the main ingredient. The texture was extremely fine, smooth and foamy. The light and earthy taste of asparagus was scrumptious! As for the eggs benny, it was wonderfully unique. 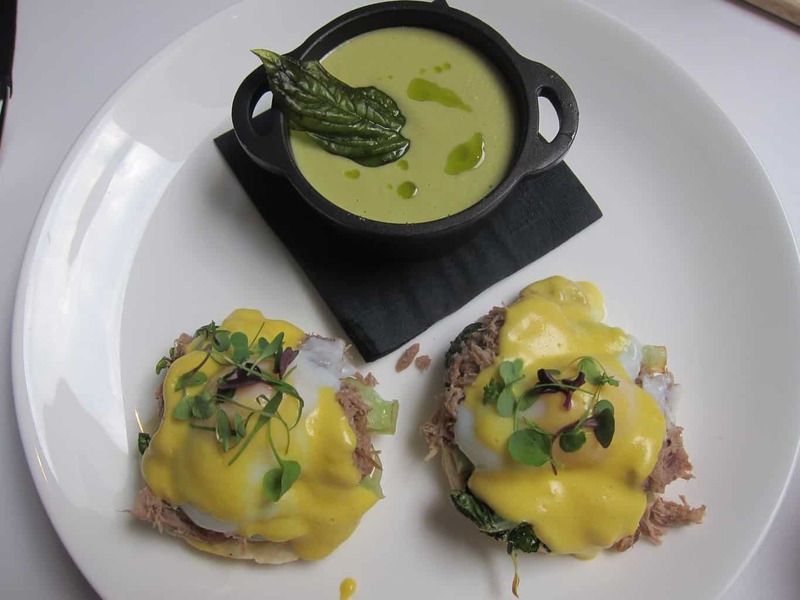 The perfect poached eggs mingled with house-made hollandaise sauce, bak choy and shredded duck confit on top of a house biscuit – it’s HEAVEN! I must admit it was pretty clever to use bak choy to give the dish a touch of Asian flavour. What really impressed me though was their hollandaise sauce – it was not thick or heavy at all!! I was completely hooked by its mousse-like texture which just instantly melt in your mouth. Kev chose the lunch special ($21) that came in 3 courses, with thai chili calamari as the appy, lava burger & fries as the entree and concluded with mini bite desserts. Unlike regular calamari, their version was not served with fried squid. 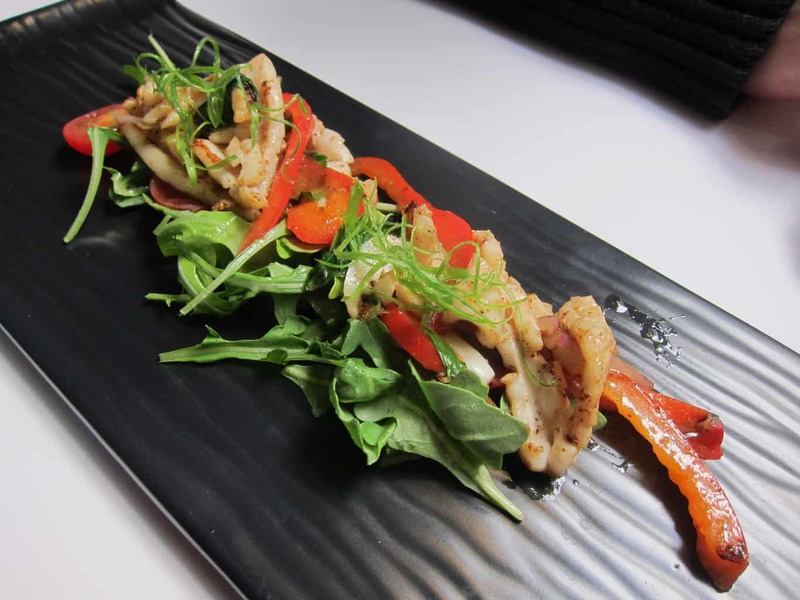 Here, the cooked squid was mixed with grape tomatoes, arugula and lime vinaigrette, making a lightly flavoured and utterly refreshing dish! Normally, I would avoid eating the arugula because I found its bitter taste undesirable. But in this dish, the arugula and tomatoes balanced each other so well that the bitter taste was no where to be found! Magical eh?! WOW, the thick, juicy beef patty took Kev aback for a while. He pondered for some time on the best way to hold the burger and consume the first bite. Anyways, the impending first bite unleashed flavorful goodness! The beef was sooo soft and really tender. Before you started chewing, it had already dissolved in your mouth and found its way to your stomach. There were a few slices of pork belly in the burger which you don’t normally find in traditional American burgers. 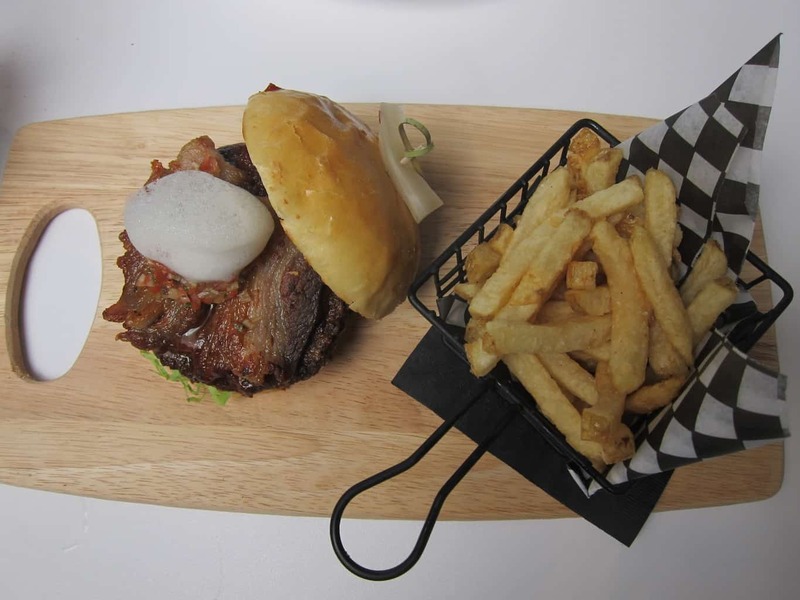 Their house-made BBQ sauce offered a nice, but not overwhelming, sweet flavour that really brought out the true taste of the beef. The parmesan foam simply added a cool visual flair to the plate. 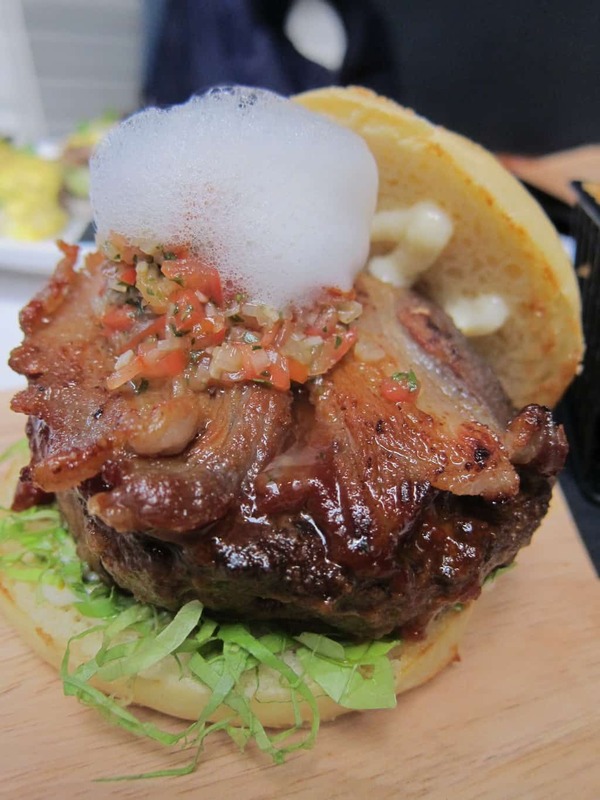 Kev said it tasted amazingly better than any other burger we had tried in Las Vegas! 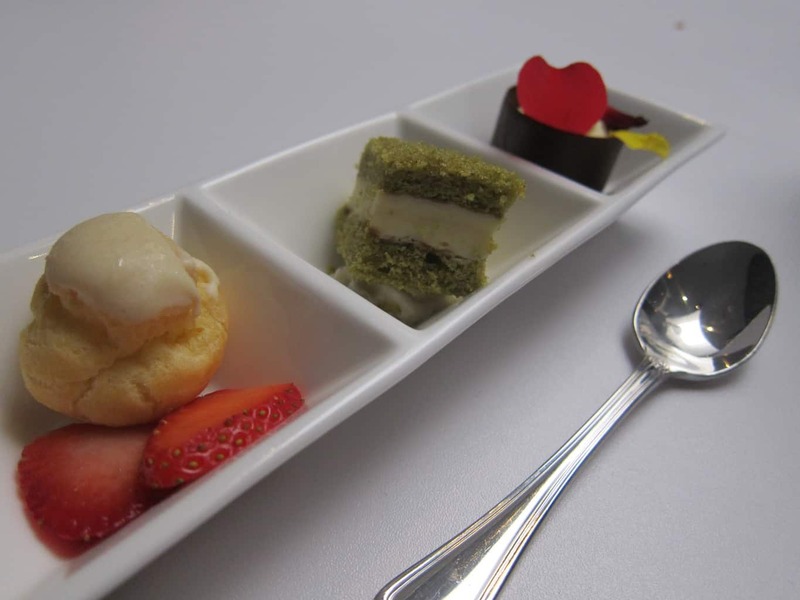 Lastly, the meal concluded with 3 tiny desserts – strawberry puff, green tea cake and chocolate mousse, which we found quite ordinary. Disclaimer: Only the Lava Egg Benedict was paid for by Lava Dining. All opinions are my own. 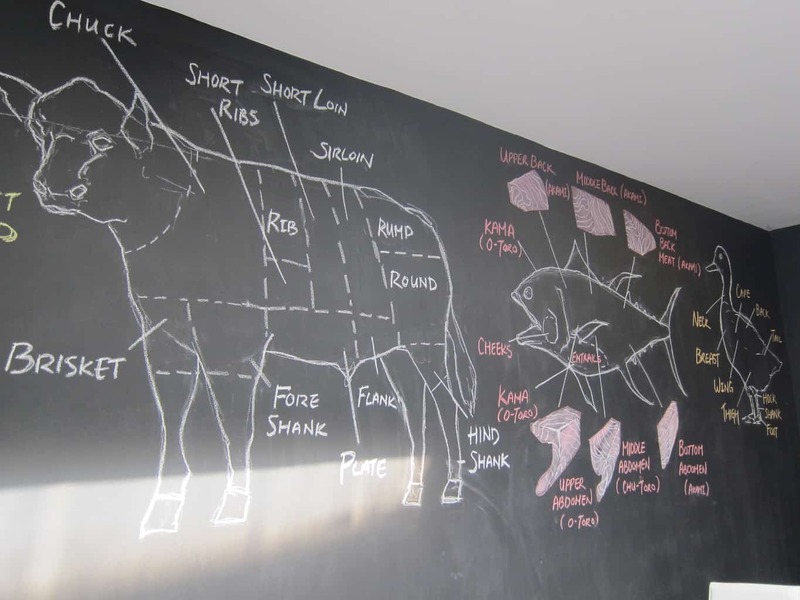 Amazing place with creative dishes! Love it! It is a great find ? 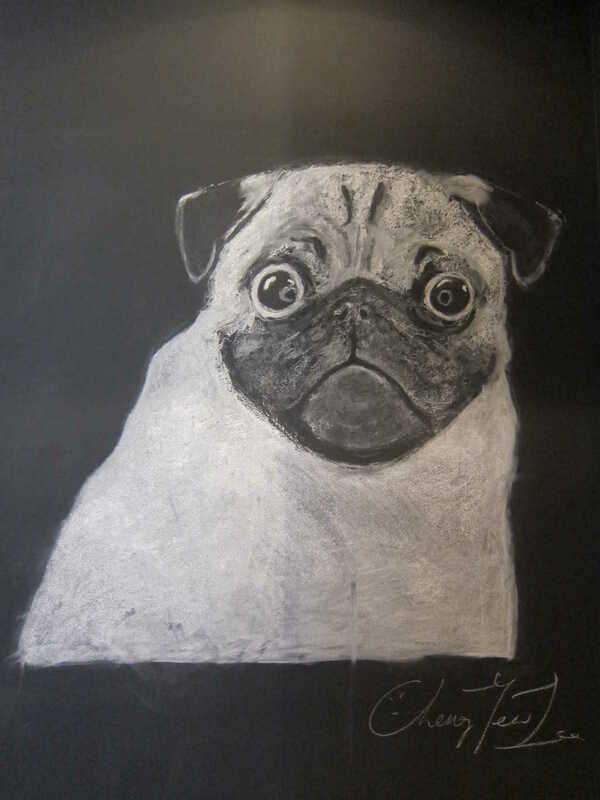 Thank you so much for sharing this, the restaurant sounds amazing and I am particularly fond of the pug!! Thanks for stopping by! 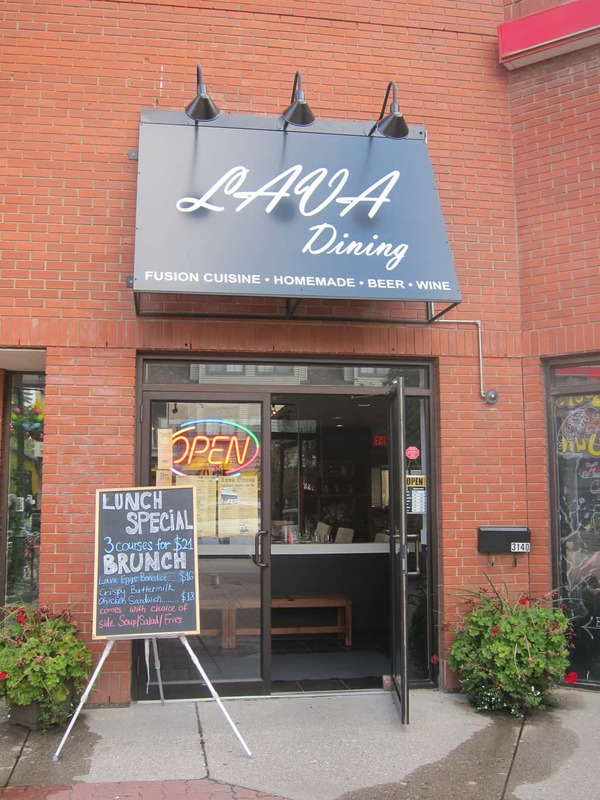 Another great brunch spot ? It has got a wonderful atmosphere. Perfect for a date!